China is criticized for its use of deeply controversial surveillance systems to control untrusted elements of its population. But the U.S., too, is developing such know-how as artificial intelligence fast becomes a leading factor in the race for power in the new world order. What's happening: Since humans began resorting to war, technology has been decisive in who prevails. Today, as the U.S.-led, post-World War II system of global power unravels, next-generation influence will hinge on mastery of AI-infused technology that, while perhaps having innocent origins, has often been weaponized. The big picture: Lisa-Maria Neudert, a researcher with Oxford University’s Computational Propaganda Project, says researchers are working on powerful AI technologies with enormous potential for good. But the technology also can have malicious uses — facial recognition employed for police purposes at a football stadium can also be used to repress the Uighur people of western China. "When these technologies become weaponized, they can be used for surveillance, manipulation and self-generating propaganda," Neudert tells Axios. But "persuasion architectures via surveillance-based micro-targeting are already deployed in the United States," Zeynep Tufekci, a professor at the University of North Carolina at Chapel Hill, tells Axios. Mostly that has been for use in advertising, such as at Facebook. "But we've already seen it used for politics and more," Tufekci said. "The idea that governments in Western nations will not want to get in on such a potent tool is ahistorical. If you build it, the powerful will want to use it." Over the last few days, a number of long articles have described the role of AI in a lurch to a new techno-authoritarianism. 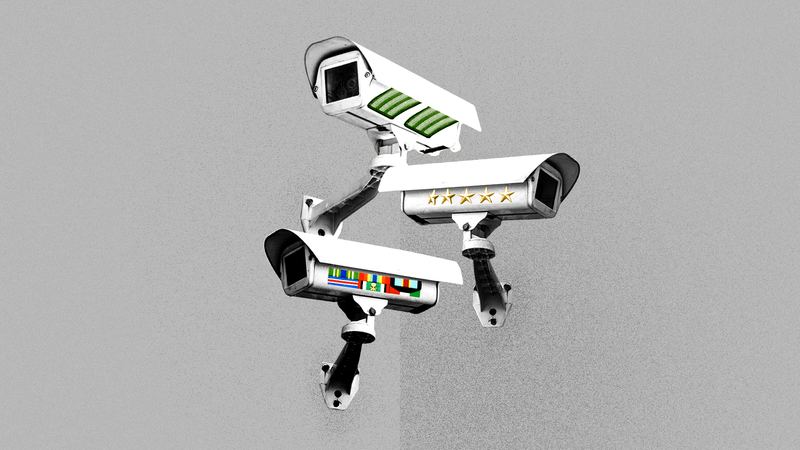 At the WSJ, Richard Fontaine and Kara Frederick, of the Center for a New American Security, wrote that not just China, but Egypt, Russia, Venezuela and Zimbabwe, too, are aggressively employing cameras and facial recognition systems to track their citizens. At the WP, Robert Kagan argued that such technology was enabling the new muscularity among authoritarian regimes — and pushing the West back on its heels. Kagan asserted that democratic countries will treat the new technologies radically different from authoritarians. He tells Axios, "We may find ourselves back where we were circa 1914, when the only free, democratic space was in what Walter Lippmann called the 'Atlantic Community' — comprising the U.S. and Western Europe." As we have previously reported, the world appears to be dividing into new zones of technological and geopolitical power resembling the Cold War. Facial recognition and other AI-infused systems are fundamental to the trend. Canadian academic Janice Gross Stein calls it a "rebordering" of the world into virtual and legal spheres of influence, one led by the U.S. and the other China. Beijing's surveillance system is an example of the "digital authoritarianism" through which it will rule its zone, according to British analyst Nicholas Wright. Said Kagan, "This will certainly give new meaning to the 'smart city' insofar as that in the hands of authoritarians, the 'smart city' is also the 'surveillance and control city.'" Every big grocer in America has spent the last year assuring shoppers and investors that it is not falling behind when it comes to grocery delivery. Walmart is touting delivery partnerships with Point Pickup, Skipcart, AxleHire and Roadie. Kroger is expanding its autonomous delivery service from city to city. Target has teamed up with Shipt. Erica writes: But experts watching food retail tell Axios that they have yet to see a clear demand signal for food delivery. Retailers may be running at this logistically difficult, extremely low-margin service for relatively little return. Some analysts in fact predict explosive growth in delivery. UBS projects it'll jump from a $35 billion industry to $365 billion in the next 10 years. But despite such bullishness — venture capitalists invested $3.5 billion in food delivery companies last year — the delivery market is still just 1% of total food retail, according to McKinsey. "No one really knows what the demand for food delivery is, and we don't know how much it'll cost. We're flying blind in the dark." The reason grocers are obsessing over food delivery is the looming threat of Amazon, but now the e-commerce giant itself is seemingly doubling down on physical stores. Amazon is plotting to open its own grocery chain, in addition to the 470 Whole Foods stores it already owns, reports WSJ. John Stanton, a professor of food marketing at Saint Joseph's University, says he's not surprised. "For Amazon, it was never just about Whole Foods. Buying Whole Foods was just a way to get into food retail." While Amazon charges ahead on brick and mortar retail, the other big grocers are struggling with the logistics of delivery. Walmart is dealing with unexpected consequences of delivery like navigating crowded aisles and managing a patchwork of drivers, per WSJ. "The need for the American government to improve its understanding of what was going on within its borders was underscored by the Great Depression. It wiped out billions of dollars in paper assets and threw millions of Americans out of work in a panic in which nearly half the nation’s banks failed. In response, Hoover appointed The President’s Research Committee on Social Trends and charged it with examining American life. The committee called for an array of 32 statistical series exploring everything from education to women, work, the family, and crime and punishment. A second group appointed to examine the economic effects of the space program in the 1960s called for the development of social indicators and recommended ongoing attention to producing systemic social accounts and improved statistical information. All of this work languished during the Nixon administration and was buried when President Reagan took office. Still, these seminal efforts took root in Europe, where several nations, including Great Britain, provide periodic reports on social indicators. My point is that the social indicators movement is much older than commonly understood. Simply improving the methodology under-girding measurement of GDP does little or nothing to improve the development of broader statistical series. These should go beyond measuring the scale and scope of the economy to actually examine and make some judgments on the quality of life of the people the economy is supposed to be supporting." "Is a Manhattan Big Mac really worth 27% more than a Phoenix Big Mac, or does that just reflect the inefficiencies of the place? I suspect a Big Mac is a Big Mac. [There are] all kinds of tangible distortions before you worry about the intangibles." Hello and welcome to the nerdiest 1 fun thing ever. Today, we listen as Alan Smith, data visualization editor for the Financial Times, makes music — with U.S. treasury bond yield curves. These are charts that show short-, medium- and long-term interest rates on treasury bonds. Kaveh writes: It's not just a sonic experiment — it's a new way to absorb data that can be difficult to visualize over time. Something to jam out to next time you're pondering the long-term health of the U.S. economy.